The film focuses on the power of a young female protagonist, Meg Murry, played by breakout star Storm Reid who navigates space in an attempt to find her scientist father who has disappeared. 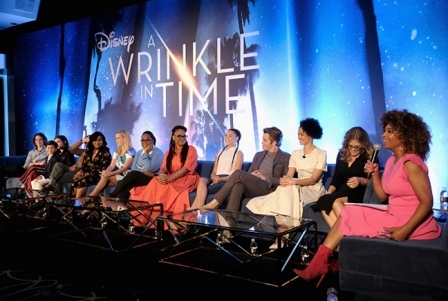 “This is a journey across the universe, but at the heart of it is a family story that empowers young girls,” screenwriter Jennifer Lee said. Actor Mindy Kaling fits that bill. “She’s a woman of color with a show with her name on it. She represents a woman that we’ve never seen on television and film, so she’s so important to the culture in that way. Kaling plays Mrs. Who, who speaks almost exclusively in the words of contemporary and ancient philosophers. The kooky, yet sassy Mrs. Whatsit is played by Reese Witherspoon. While Oprah Winfrey was cast as the enlightened Mrs. Which, the eldest of the three. With these celestial beings designated as Meg’s guardian angels, the audience witnesses her overcome fear, before excersing and finding her true power. It is a juxtaposition to her co-stars, Charles Wallace, Meg’s younger brother played by Deric McCabe, and her friend Calvin, played by Levi Miller, who have zero inhibitions as the three embark on this mission to rescue her father. Oscar-nominated director, DuVernay, was joined by the cast and Lee at the W Hotel in Hollywood, CA to discuss the importance of seeing women in lead roles in this Disney children’s film. “I think when you’re a stand-up comic, you have a… not a chip on your shoulder, but that's where you come from and to be involved in such a big, big movie like this, it makes me… I feel real proud,” said actor Zach Galifianakis, who plays The Happy Medium. Galifianakis got choked up when he spoke about working with DuVernay and his castmates. His remarks touched on the importance of boys and young men seeing alternate images of masculinity. In “A Wrinkle in Time, this manifests in both his character Happy Medium, who isn't afraid to be emotional, and with Calvin, a teenage boy who follows the lead of a teen girl. With this film, DuVernay became the first African American woman to solo-direct a movie with a budget of over $100 million and the fourth woman to do so. DuVernay, who started out as a film publicist, launched her filmmaking career with documentaries, including “Middle of Nowhere,” which earned a directing award at Sundance in 2012. In 2015, Selma, the drama about the life and legacy of Dr. Martin Luther King Jr. was nominated for an Oscar for Best Picture. She is also responsible for the documentary “13th” and OWN’s original television series, “Queen Sugar.” Many of which are projects that she and Oprah collaborated. It is a movie that defies race, gender set in space and yet imitates reality in many ways. The science-fictional novel written by Madeleine L’Engle, is regarded as one of the greatest classics of children’s literature, whose influence helped launch a new crop of fantasy writers. The film starring Winfrey, Witherspoon, Kaling, Galifianakis, Gugu Mbatha-Raw, Storm Reid, Levi Miller, Deric McCabe, and Rowan Blanchard, debuts in theatres on March 9.